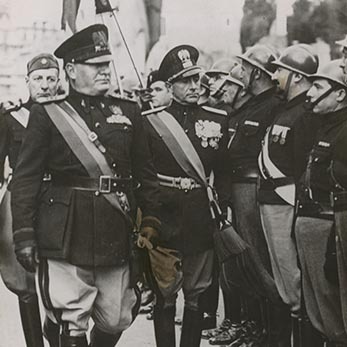 THE INTERNATIONAL ASSOCIATION FOR COMPARATIVE FASCIST STUDIES (COMFAS) is a nonprofit and non-political scholarly association dedicated to the comparative and transnational study of fascism in European and in a global context. The Association is open to graduate students, researchers, and professors at whatever stage of their career. Its aim is to promote new multi-disciplinary research approaches to this field, in a joint effort of scholars from various disciplines and historiographical traditions. To this end, COMFAS initiates thematic colloquia, workshops, summer schools and research projects on fascism and related topics such as ultranationalism, authoritarianism, political violence, racism and the Holocaust. It holds biennial international conventions to serve as a meeting ground for comparatively-minded scholars working on the history of the twentieth century. The Association’s main publication outlet is the open-access peer-reviewed journal Fascism. Journal of Comparative Fascist Studies (Brill). The basis of COMFAS was established at the editorial meeting of the journal Fascism held at NIOD in Amsterdam on 10 April 2015, The meeting was attended by Marti Huetink, (Publishing Director at Brill), Marjo Bakker, (Managing Editor of Fascism), Sam Bruisma, (Business Development Director at Brill), Roger Griffin, (Consultant Editor), Nigel Copsey, (Editor in Chief), Constantin Iordachi (Editorial Board Member), Aristotle Kallis, (Editorial Board Member), and Wim van Meurs (Editorial Board Member).